If you want to review the pricing information for a sale, select the customer through Customer Activity, then click on L - Review Pricing and Lien Holder. This page will give you a complete breakdown of how the original balance was computed. By clicking on the Details button, you can even view the rate(s) for which the sales tax was computed. 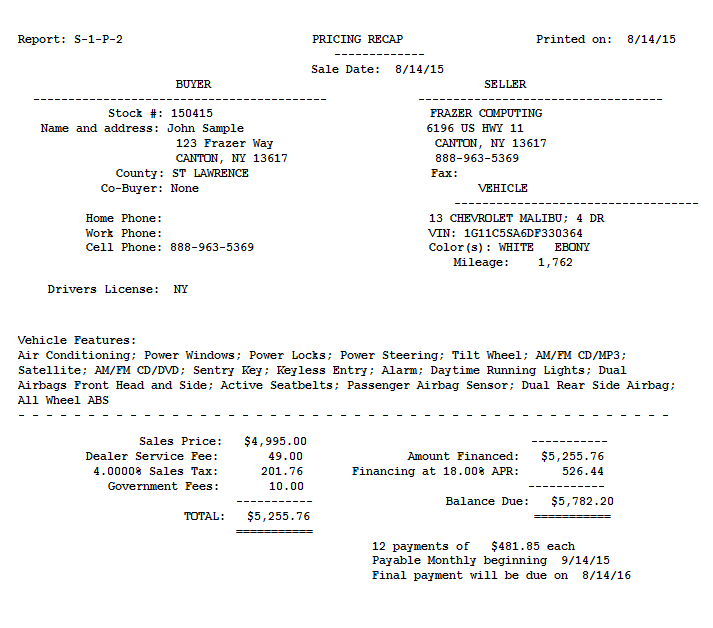 Printing this report will print out all of the pricing information, as well as the payment schedule for that customer (with an option to include the customer and vehicle information). Depending on what method you are using to compute interest and whether or not the customer pays off early, the finance charge given in this report may or may not be what you actually receive as interest. •If you are using the Pre-Compute method to calculate interest (Straight Line or Rule of 78s), the finance charge will be exactly what you earn in interest. However, if the customer pays off early, you will lose some of the finance charge as unearned interest. •If you are using Simple Interest to calculate interest, the finance charge is the amount of interest you would earn if the customer pays exactly according to their payment schedule (to the day). If the customer makes a payment early, you will earn slightly less in interest, and if the customer pays late, you will earn slightly more in interest. Thus, the finance charge is simply a predicted amount.